Advantage-L models are compact central medical/industrial vacuum systems, able in most cases to fit through a 36 inch doorway. Advantage-L systems employ our U-series oil-flooded pumps for those applications that require operation at higher vacuum levels, up to 29.83 in. Hg. (2.0 torr). These applications include medical/surgical, laboratory, material handling, and other industrial processes. 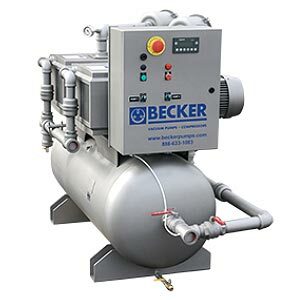 Our medical/industrial central vacuum systems are available NFPA 99 compliant for medical/surgical use.